The Public Safety Assessment is supposed to help judges make bail decisions. But when it comes to bail, the law can get in the way. The Michigan Supreme Court has launched a pilot project to test a program called Public Safety Assessment or PSA. It's a risk assessment tool using a predictive algorithm to help judges make pretrial decisions. The pretrial period is the time between someone being arrested and tried. At pretrial hearings, judges quickly have to decide whether a defendant should spend that time in jail or out on bail. To make that decision, they have to determine whether that person is likely to not show up to court or commit a crime. The PSA is an algorithm designed to help judges make that decision, and it's being promoted as a possible solution to the cash bail system. Matthew DeMichele is the director of the Center for Courts and Corrections Research at RTI International. He’s the lead author of a research study looking at the use of the PSA tool in Kentucky courts. Listen to Stateside's interview with Matthew DeMichele about his study of the results of the PSA in the criminal justice system. The tool uses nine risk factors that are essentially a series of criminal history indicators. It then tries to develop probabilities: whether a defendant will fail to appear for their trial, whether they will commit a crime, or whether they will commit a violent crime. Michigan Radio’s Lindsey Smith spent time in two of the district courts taking part in the state Supreme Court’s pilot program: 41B District Court in Clinton Township and 31st District Court in Hamtramck. Listen to Stateside's interview with Michigan Radio reporter Lindsey Smith about how these tools are being used in Michigan. She says it made a huge difference in Hamtramck. Before they had this assessment tool, Chief Judge Alexis Krot was spending just maybe two minutes interviewing someone before deciding where to set their bond. These assessments are new to Hamtramck, but not to Michigan. 15 counties, including Oakland, Muskegon, Washtenaw, and the City of Detroit have a similar sort of tool. But there are still downsides to these tools that are operating in a flawed system. Shobita Parthasarathy heads the Science, Technology, and Public Policy Program at the University of Michigan. She says bias against poor people and people of color are still baked into risk assessment tools. “As with all areas of society, we in the criminal justice system are always trying to reach toward scientific explanations because somehow we see that as objective, as standardizable, and that that can somehow take out human judgement in the system," says Parthasarathy. For example, the tool doesn’t take into account why a person didn’t show up for court. Maybe they didn’t have access to transportation. Maybe they showed up to the wrong court. Judge Krot says sometimes people just aren’t organized and forget. Some have a job where you don’t get paid time off. And many people can’t afford cash bail altogether. “You know, the financial reality of our community is most people don’t have a thousand dollars or $2,500 or something sitting around to post for their friend of their brother or their sister or their cousin to get out. You know, they need that money for something else so this is a good way to get them back here without taking their family’s resources away from them,” says Krot. The judges and magistrates using these pretrial risk assessments, including judges in this Michigan pilot program, are still allowed to require a financial bond — and they do. In some cases, judges don’t have a choice in how to set bail. Take this example from Clinton Township: A man was arrested for not paying child support. The tool says he’s a risk level 1, the lowest risk rating out of 6. He’s going to come back to court, has no criminal record at all, and has a job. But his bail was set at $47,471. The magistrate had no choice. State law dictates this guy’s bail is $500 or 25% of what he allegedly owes, whichever is greater. A common criticism in the conversation about bail reform is in order to make any real difference, laws need to be changed, too. John Raphling is a senior researcher at Human Rights Watch. He studied a risk assessment tool in California. Raphling found that there's a correlation between pretrial detention and likelihood of conviction, because sometimes it’s easier to just plead guilty than to be stuck in jail. A new lawsuit aims to end cash bail and overhaul the pre-trial justice system at Detroit’s 36th district court. The ACLU filed the federal class action suit Sunday. It argues that the 36th district’s current process for arraigning defendants violates their constitutional rights in several ways. 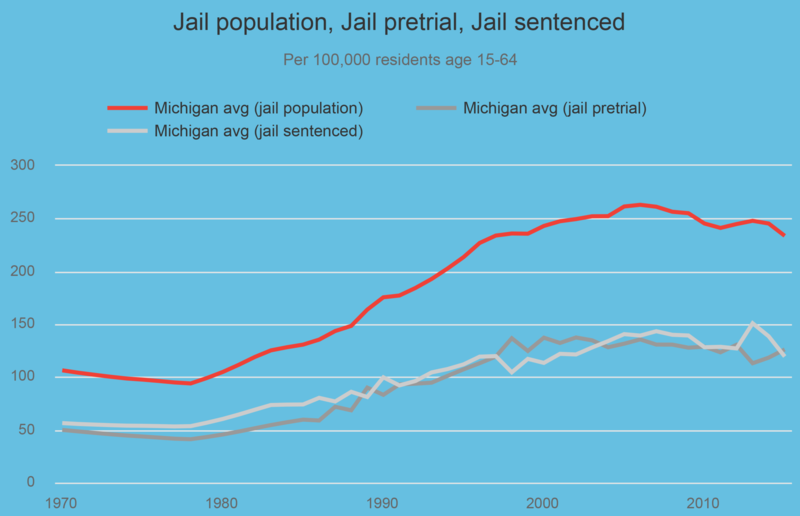 Michigan’s cash bail system needs an overhaul. That’s the message of bipartisan legislation introduced in the state House and Senate. Representative Tommy Brann (R-Wyoming) wants to get rid of the requirement that parents who owe back child support pay bail to get out jail before they see a judge.